The VX 820 DUET is a dual-user, feature-rich countertop solution with design and functionality that meets merchants’ and consumers’ needs. Merchants appreciate getting what they need in one device – great functionality and consumer ease of use. Merchants can quickly and securely accept multiple forms of payment from credit, debit and EMV to NFC/contactless.Consumers can process payments using the large, bright-color touch screen display, and the handheld unit fits in the palm of their hand. 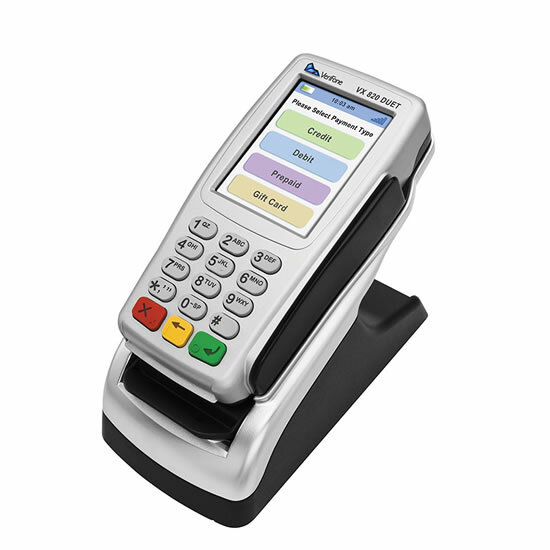 The VX 820 DUET has the muscle for fast transactions and the brains to deliver great customer interactions.